Is it too early to start talking about The Mighty Boosh? Series 3 will be shown on BBC3 at 10.30pm on Thursdays from the 15th November. Apparently it's going to be repeated Sundays too, I think. Hurrah. Also, if you didn't know, Noel Fielding is going to stand-in for Bill Bailey on a few episodes of Never Mind The Buzzcocks. Not sure when he's on but the new series of that starts next Thursday too. Hey Papa, what's the etiquette here? Do I put Mighty Boosh in the tags or do you? Or do you mind/does it make a difference? no worries, add them tags, jermajesty. at the risk of plugging radio 1 and their listen-again feature too much, they’ve had some good guests on chris moyles lately. i realise that moyles isn’t to everyone’s tastes but on monday (12th) alan carr was on and this morning (14th) russell brand was on. what i heard of both was very entertaining. both shows are still available to listen to online, and are each there for 7 days from broadcast - which is why i keep pedantically saying the dates in case anyone wants to listen before they disappear. sorry to go on – i’ll shut up now. I listened to the Colin Murray thing - it was good cos they played a couple of their fave records and the documentary bits were interesting. It filled in a bit about their pre-TV history for those, like me, who didn't already know. Also it gave some perspective on things that shaped their worldview/the show. I was really pleased that they mentioned The Goodies cos, although some of it doesn't stand up so well, parts of The Goodies are still genius and it was just the best show on TV as a kid. 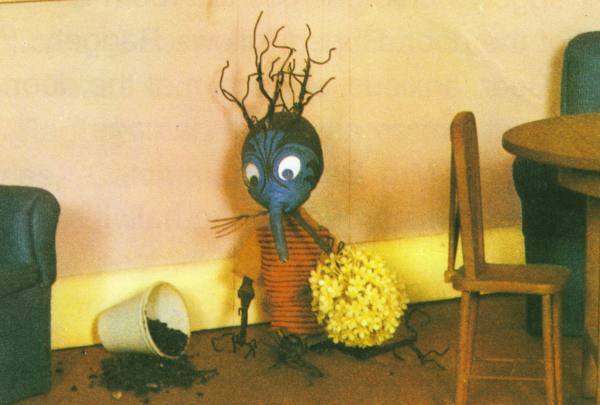 Also the mention of Raggety the tree-elf from Rupert Bear - it makes so much sense! I only have vague memories of the Rupert TV show but it was kind of disturbing and Raggety is such a Boosh character. Check out more pics from Rupert there. I only half remember stuff from that show too - it feels almost like I dreamt it. I don't remember watching it a lot but I think it's more that I was so young when it was on. I think you can see a direct influence on Boosh characters; it makes perfect sense. Ooh - I've just discovered interesting things happen to the font size on the popular tags bit if you put the Tag in again. Very exciting and techno-fun. You're a legend. I've seen the tags on other sites, and wondered how they got their tags to be all different sizes, and now I know. So, what did we think of the first Boosh then? I enjoyed it but didn't find it hilarious. I think my expectations were a bit too high but hopefully they'll settle down into an enjoyable run. My very favourite bit was when Vince went to tag the top popster - lifting his trouser to reveal absurdly thin bird-legs. Second one was a bit better though I thought. Effects were quite good for El Cheapo Beeb. i know it's going off topic slightly but i believe that the guy in charge of visual effects is a chap called tim hope. i only paid attention to this cos i'd seen an ace award-winning animation he did years ago - the wolfman - so was delighted when i saw his name on the first or second series of the boosh. thanks to the wonders of youtube you can all watch it too. it's not particularly funny but is quite spooky. and mental. I thought that the second episode was much better, even though they recycled yet another character from series one (The Spirit of Jazz). I will be sticking with it, though. I'm willing it to be excellent with every fibre of my being. I just wish I'd checked here ealier while there was still time to catch those Listen Again links. We don't tend to listen to Radio 1 in our house and we especially don't listen to Chris Moyles but I think I could have stomached it/him in snippet form if it meant catching someone far more interesting and rewarding in the process. I once worked at the BBC, you know. Fugging awful place - worst job I've ever had. *As an aside, did anyone watch Snuffbox, with Rich Fulcher and Matt Berry? Very good but perhaps an acquired taste.